Critics of the administration's immigration policies are pointing to data on the thousands of immigrants convicted of crimes - and then released - as evidence that there should be no further leniency toward those in the U.S. without permission. The report from the Center for Immigration Studies (CIS) - a group that advocates for lower levels of legal immigration - shows that 36,007 immigrants in the U.S. illegally who were convicted of crimes were freed from Immigration and Customs Enforcement (ICE) custody, including those who had multiple convictions. Those numbers include 193 homicide convictions, 426 sexual assault convictions, 9,187 dangerous drug convictions, 16,070 drunk or drugged driving convictions and more. The crimes detailed in the CIS report were not necessarily all committed by immigrants in the U.S. illegally. Legal permanent residents can have their green cards revoked and be taken into ICE custody for removal if they commit certain crimes of "moral turpitude" such as certain aggravated felonies. The study's author, Director of Policy Studies Jessica Vaughan, said she did not know what percentage of the 36,000 people have green cards, but estimated it was a small. CIS says the report is based on ICE data they obtained that was prepared in response to congressional inquiries. 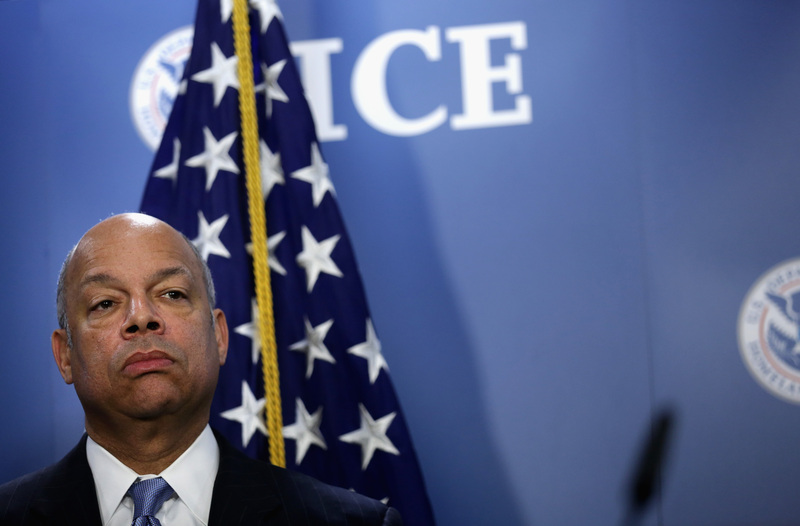 The data comes as Department of Homeland Security (DHS) Secretary Jeh Johnson is undertaking a review of the nation's deportation program at the behest of President Obama. The Associated Press has reported that Johnson is considering limiting the deportation of immigrants who are in the U.S. illegally but do not have serious criminal records. "The revelation that 36,007 criminal aliens were released from ICE custody in 2013, an average of nearly 100 per day, is shocking, and could further shake public faith in the effectiveness of current immigration enforcement policies," the CIS study concluded. "This information is sure to raise concerns that, despite professions of a focus on removal of criminal aliens, Obama administration policies frequently have allowed political considerations to trump public safety factors and, as a result, aliens with serious criminal convictions have been allowed to return to the streets instead of being removed to their home countries." Sen. John Cornyn, R-Texas, wrote a letter to Johnson after the study was released saying DHS had "failed to live up to" its duty of protecting the public from immigrants who had committed criminals. He also said the report would further reduce Congress' ability to trust the administration, which House Speaker John Boehner, R-Ohio, has cited as a key factor holding up immigration reform. "Achieving bipartisan border security and immigration reform will require the American people to trust that DHS and the Obama administration is committed to the faithful execution of the laws passed by Congress. Unfortunately, your Department's release of more than 36,000 criminal aliens in FY 2013 has done great damage to this goal," Cornyn wrote. "Convicted criminals come into the agency's custody to undergo removal proceedings after they have already satisfied the terms of their criminal sentence," said ICE spokeswoman Gillian Christensen. "In many of the releases in 2013, ICE was required by law to release the individuals from custody, pursuant to decisions by the Supreme Court and other federal courts. Once in ICE custody, many of the individuals described in the report were released under restrictions such as GPS monitoring, telephone monitoring, supervision, or bond." Not all crimes will automatically lead to an immigrant being removed from the U.S. There are also some court decisions that have determined ICE cannot hold someone in custody indefinitely if it is unlikely they are likely to be released in the forseeable future. That includes situations where the person's country of origin refuses or delays the person's reentry, or the U.S. his limited diplomatic relations with that country. Christensen said that court-mandated decisions "account for a disproportionate number of the serious crimes" in the report. For example, she said, the release of 72 percent of immigrants convicted of a homicide were court mandated. Additionally, not all immigrants will be held in ICE custody while they are challenging their deportation orders in court. Others who have served their sentences will be released "as a discretionary matter after career law enforcement officers made a judgment regarding the priority of holding the individual, given ICE's resources, and prioritizing the detention and removal of individuals who pose a risk to public safety or national security," Christensen said. But the study's critics, namely groups that support efforts to extend legal status and citizenship to more immigrants who are in the country without permission, say it distorts the real picture of ICE releases. "It's designed to scare the American public with a lot of misleading information," said Gregory Chen, the director of advocacy for the American Immigration Lawyers Association. He said that the report's definition of criminals who have been "released" includes those who are still subject to supervision including electronic ankle monitoring and regular check ins with ICE. He also described the agency's process for determining which people would pose a public threat is as "very rigorous." "Rather than attacking the use of smart effective methods like alternatives to detention....there should be better information out there indicating that these are the smart, effective methods to protect the community and also to save the taxpayer dollars," Chen said. He said the criminal justice system has increasingly relied on non-detention methods of supervision lately, but that ICE has embraced detention so much that the numbers have more than doubled since 2001 to more than 400,000 in FY2012. Less than 100,000 people were detained in 1994. The data obtained by CIS does not include information on the conditions under which each immigrant was released. But Vaughan, the study's author, called into question the effectiveness of non-detention methods. "I think the word supervision here implies that these individuals are actually being monitored closely when in fact some of the forms are supervision are very light supervisions such as the offenders simply having to make a phone call to an ICE office periodically," Vaughan said, adding that she knows of cases where the ankle bracelet monitors have been cut off. Both Chen and Ben Johnson, the executive director of the American Immigration Council, also noted that most of the immigrants detained by ICE had previously served out whatever sentence the U.S. criminal system determined was appropriate for their crime. Johnson said that some people who are released are awaiting a decision while their immigration status appeals go through the court system. "We should be proud of the system that we have and the fact that we don't lock people up forever," the said. "These kinds of scare tactics that cause us to question that fundamental system I think are unfortunate."